Solo is happy to announce that their annual His & Hers Graphic Tee Design Competition is now up and ready to accept entries starting this festive month of May! Confirmed to be distributed this Holiday Season, Solo sets this year's competition with the theme Pinoy Prints and Patterns. But before I proceed into telling you what's in store to the winners of this year's competition, Solo is more delighted to share last year's winners final pieces! Held last November with a theme "Musika", Solo's His and Hers Graphic Tee Design Contest received an outstanding 200 entries. Solo is psyched to present the 5 winning entries and its creators, and they are Gino Jardinico for "Eargasm", a design that features earphones dancing to good music; Randy Pagatpatan for "Gitarista", an equally interesting guitar graphic; Jennieca Paulene Dayrit for "Musikang Pinoy", a design that will take everyone back to the early meaningful years of Pinoy music; John Theli Bien for "Rock My World, Hear My Heartbeat", which features a design that talks about a man and a woman’s music diversity; and Vincent Mark Baquiran for "Music Love and Astronauts", which shares a vivid illustration of astronaut lovers keeping in touch through music! If these designs inspired you, then showoff your creativity on this year 's competiton! Submission of entries is from May 1 to June 15, 2014. Three winners will be chosen to be the next His & Hers Graphic Tee designer and win cash prize, gift certificates and the bragging rights as winning designer of His & Hers Graphic Tee Design. 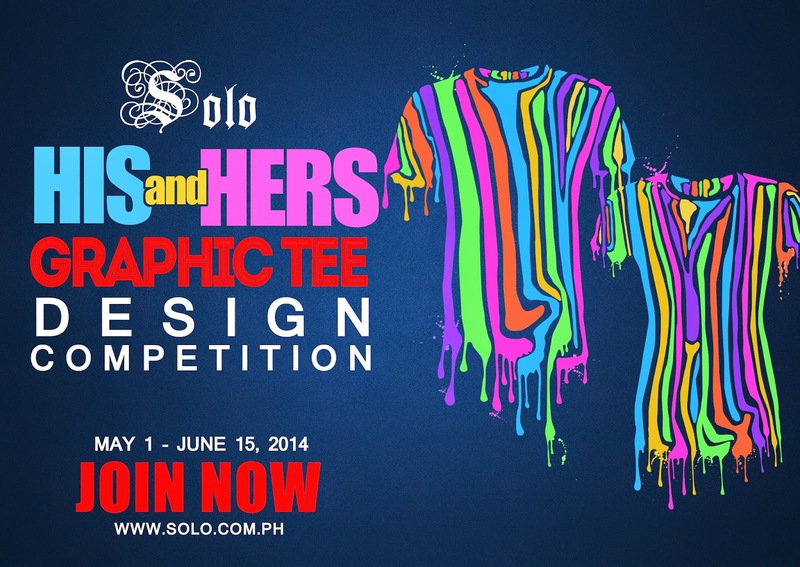 You can learn more about His & Hers Graphic Tee Design Competition mechanics and rules at www.solo.com.ph, like their Facebook page facebook.com/mysoloonline, or follow them on Twitter and Instagram @MySoloOnline. The current winning tees are available online too, so go now and start shopping!